According to Kremlin's press service, Vladimir Putin and his Iranian counterpart Hassan Rouhani stressed the importance to continue close cooperation on political and diplomatic settlement of the Syrian crisis during a phone conversation. MOSCOW (Sputnik) – Russian President Vladimir Putin and his Iranian counterpart Hassan Rouhani stressed the importance to continue close cooperation on political and diplomatic settlement of the Syrian crisis during a phone conversation, Kremlin's press service said Sunday. "The Leaders also noted the importance to continue close cooperation on political and diplomatic settlement of the armed conflict in Syria," the press service's statement read. The two leaders also expressed readiness to deepen cooperation in the fight against terrorism to ensure stability in the Middle East. "Particular importance was paid to the key aspects of the bilateral cooperation in the sphere of counterterrorism, a readiness to deepen cooperation in order to ensure stability in the Middle East was expressed," the statement said. Russian President Vladimir Putin discussed on Sunday the situation in Syria during a phone conversation with his Iranian counterpart Hassan Rouhani, the Kremlin press service said in a statement. “On the initiative of the Iranian party a phone conversation between Vladimir Putin and President of the Islamic Republic of Iran Hassan Rouhani was held. … [The presidents] exchanged their views of the situation in Syria. Both parties pointed out the inadmissibility of US aggressive actions against the sovereign state in violation of the international law. Putin and Rouhani called for holding an objective, impartial investigation of all circumstances of the incident involving chemical weapons in the Syrian province of Idlib on April 4,” the statement read. 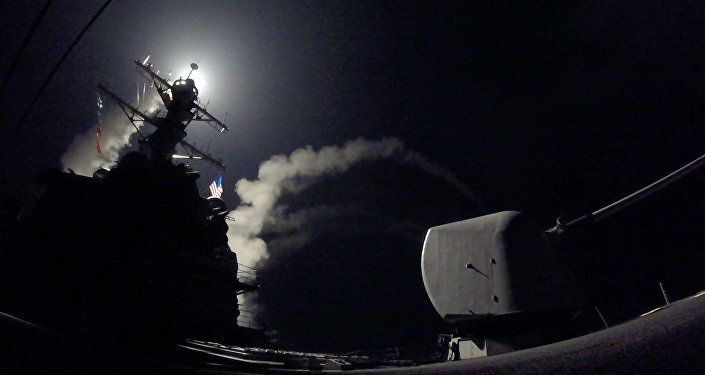 On Thursday night, the United States launched 59 Tomahawk cruise missiles at the military airfield in Ash Sha’irat. US President Donald Trump said that the attack was a response to the alleged chemical weapon use in Syria's Idlib province on Tuesday, which resulted in the death of over 80 people, an incident which Washington blames on the Syrian government. The Russian Defense Ministry said on Wednesday that the airstrike near Khan Shaykhun by the Syrian air force hit a terrorist warehouse that stored chemical weapons slated for delivery to Iraq, and called on the UN Security Council to launch a proper investigation into the incident. Putin said Thursday that groundless accusations in the chemical weapons incident in Syria's Idlib were unacceptable before the investigation into the matter had been carried out while Foreign Minister Sergey Lavrov on Saturday criticized the US missile attack as a violation of the international law.